The crazy idea I had for years is finally real: I wrote a book about EarthBound’s localization, and it released yesterday! If you’ve visited my old MOTHER 2/EarthBound comparison site in the past, you know a lot of work into it. Even so, I threw almost everything out and started from scratch this time, researching new topics, discovering new things, and interviewing key people. The result: a book that’s completely different from the site and even puts the site to shame – almost every page is filled with info that even I didn’t know until this year! You can get a taste of what I mean from these sample pages. The book is 432 pages, hardcover, and has foil stamping. It also comes with a reversible obi with a series release timeline on the back, as well as a scratch-n-sniff history card/postcard hybrid. There’s also an accompanying video that showcases things that can’t be conveyed in print form. The book is $36, and until Nov. 29, 2016 there are some big shipping deals at Fangamer: free shipping within the U.S. and 50% off IPA international shipping. And they’ll even give you free gift cards the more you buy. Basically, if you’re like me and prefer to wait until stuff goes on sale, I don’t think you’ll ever get a better deal than this! 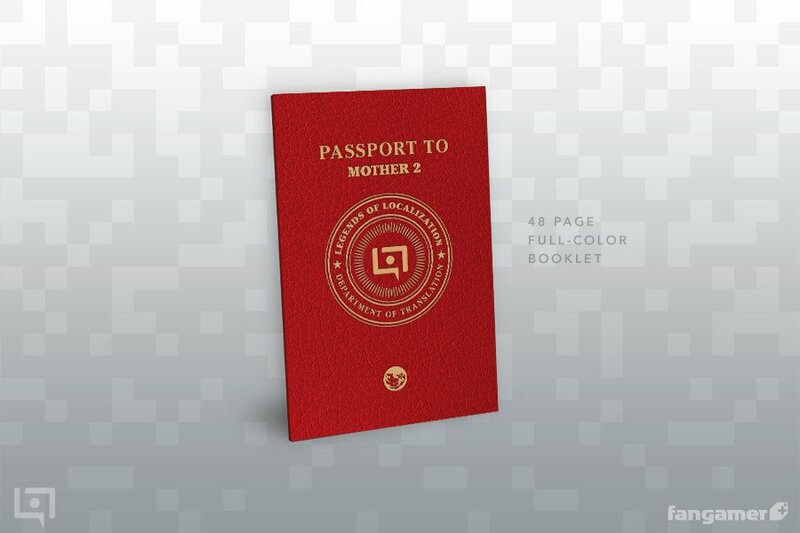 Like with last year’s Zelda localization book, I also made a companion booklet called the “Passport to MOTHER 2“. 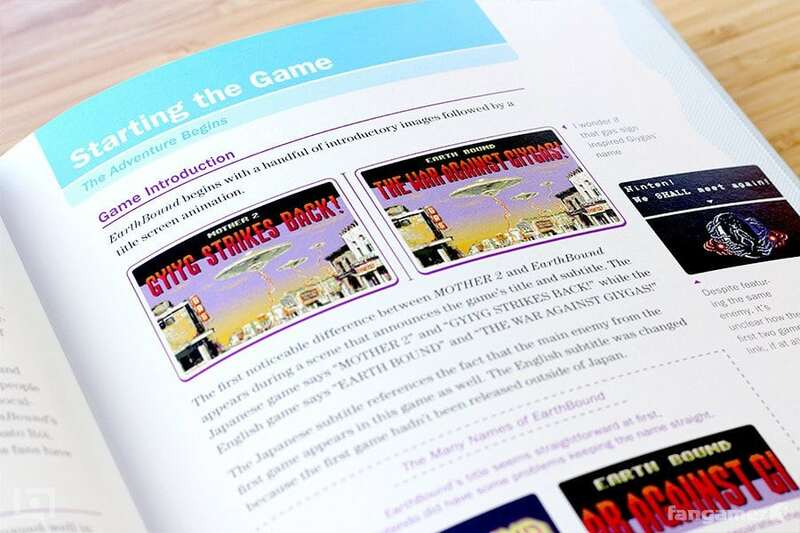 When I first started studying Japanese long ago, I really wanted to play the Japanese version of EarthBound for some reason, but there were two obstacles: I couldn’t find a way to import the game, and I barely knew any Japanese. 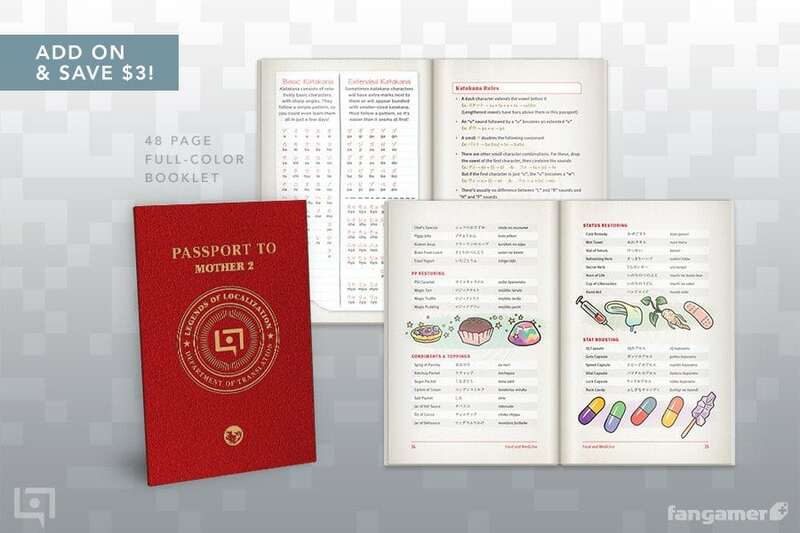 I vividly remember how that felt, so I wrote the Passport to MOTHER 2 with the second thing in mind: even if you know zero Japanese, this booklet will teach you two Japanese writing systems, basic grammar, reading tips, and a whole bunch of MOTHER 2 terms. By the end, you’ll be able to read, pronounce, and even translate some simple lines in the game – and even with more complicated lines, you’ll still be able to pick up some general info. If you’re starting to learn Japanese or ever once thought, “It’d be cool if I knew some simple Japanese” then definitely check this out. It also contains tips, tricks, and other non-language info for getting more out of the Japanese version of EarthBound. Anyway, this is all sounding very much like an infomercial, but I do want to thank everyone who’s ever supported my comparison projects over the past 17 years. I never thought anyone would want this sort of book, and if it hadn’t been for your encouragement and support it would still just be a “wouldn’t it be neat” dream. So thanks, EarthBound fans! 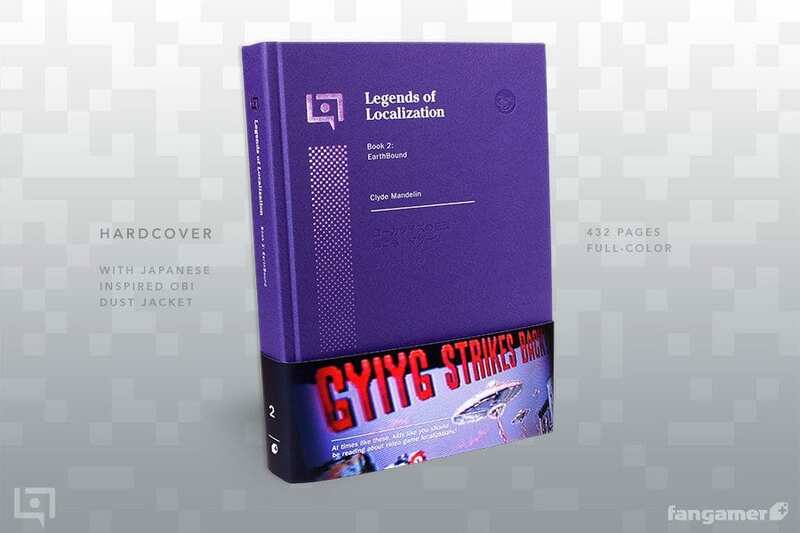 22 Comments to The EarthBound Legends of Localization Book is Here! Is there a way we can get a digital version? There aren’t any plans for a digital release at the moment. Although I imagine that could change in a year or two. Looks really nice. 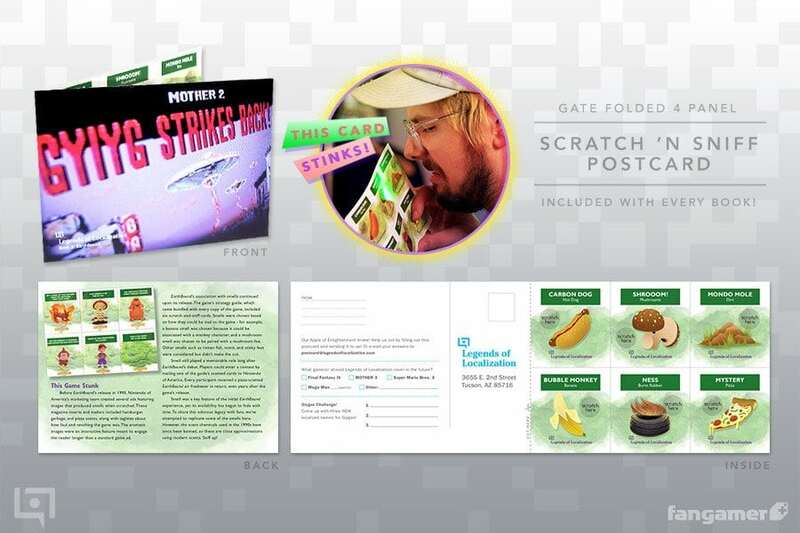 I love that you included scratch and sniff cards. I am buying this right freaking now. I love your writing style. It’s a perfect blend of light-hearted snark and a “hey, I found this really neat thing and I want to show it to you” sort of feeling. And, judging by the sample pages, you’ve dug up a lot of neat things. Christ Tomato, 400+ pages? You exceeded my expectations. I bought this right away! Can’t wait for mine to come in. I do have a concern, though. It says my order went through yet I accidentally used my old card (the only difference is the expiration date is 2 years earlier). Will it still go through? It still says they’ll notify me when it ships. Not to be that guy, buuuuuut–“fan-uh-tic.” I guess someone over at Fangamer had a little brain fart. THAT SAID, I’m excited for this, as well as the rest of the Kickstarter package. Amazing! I love the 90’s aesthetic. This is perfect timing since I was planning on getting this for Christmas, really hope it doesn’t sell out! Can I just say wow. This is incredible. I loved the first book on Zelda, and this is something even more special. I cannot wait to read it. Bravo Tomato. Bravo. This looks awesome. Hopefully I can buy it as an after christmas present for myself. What an absolute treat! I can’t wait to get it! Would you mind if I talked about it on my lame youtube once I get it? My copy arrived today! It is… amazing. I haven’t put it down yet. I don’t really know what else to say. I think this is one of those moments in EB/mother history when something really special has happened. A milestone to put it mildly. Thank you Tomato. You honor this game with your work. I just received my copy this week, and it is amazing. The fact that you didn’t just throw a bunch of Earthbound localization facts, but put so much time and care into explaining the concept of localization, and your own journey (cool!) at the beginning really made this feel like something that transcends a normal book. The entire time I was reading the intro – it’s so big it’ll be weeks before I make it through all the content – I was thinking, it’s so incredible that you were able to capture this part of yourself and the community into something permanent. Also, I have to post once more to say: The cover texture effect is incredible and so Earthboundy. So many details like that make this utterly unique and tied to Earthbound. My copy is almost here! I can’t wait! You cant print gifs… yet. “…while EarthBound is just a game, it’s one of those rare games that brings out the best in people.” <– I've been saying this since I first played this wonderful, beautiful, magical masterpiece in 2008. It's such a grand, cohesive experience, and to think you're able to experience it on a Super Nintendo of all things!!! Hey there, I once had EarthBound complete with the game guide some eyars back, but just after I started playing the game, I had to sell it off with a ton of other precious games due to space issue and financial responsibilities. Since then, I was able to purchase it again on the Wii U (thank god), but I just couldn’t bring myself to play it without the original game guide which cost waaay too much on eBay. But today, I came across your EarthBound Central site while search for a good price for the manual. Low and behold, it pulled up your link to the PDF guide. 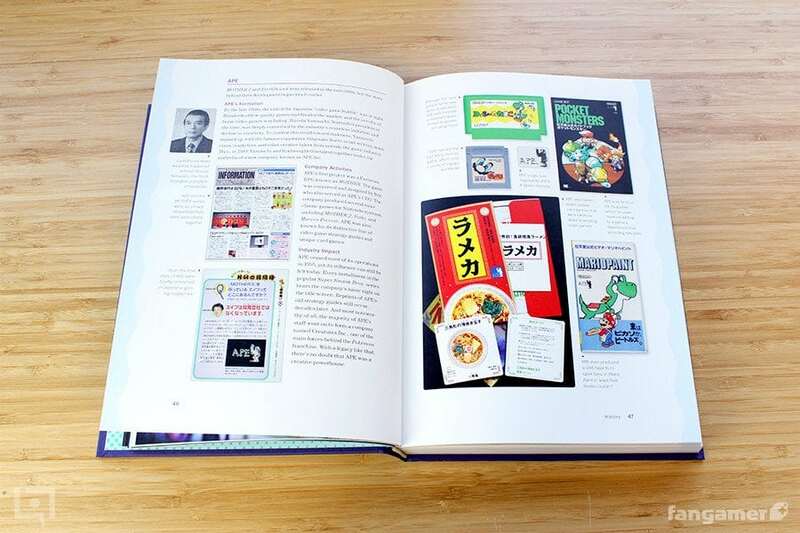 As a token of my thanks, I decided to purchase your EarthBound Legends of Localization book from Fangamer. I liked the sample pages I read and look forward to reading it after I play through EarthBound. We really appreciate your hard work.